I’m Tanner Roos from Linn Grove Elementary School (Linn-Mar) in Marion, Iowa. 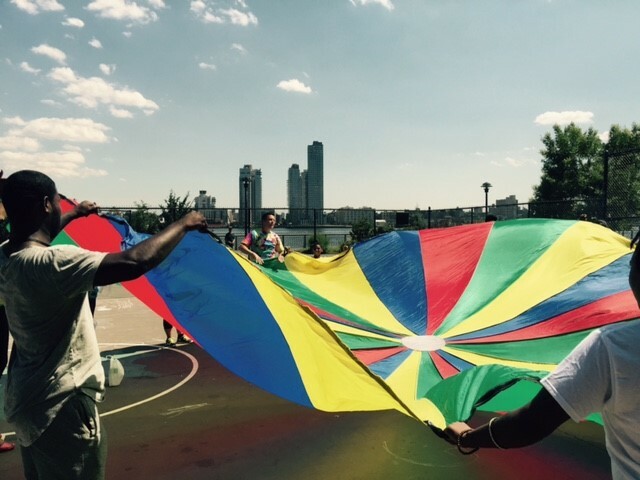 Recently we started using the parachute with my kindergarten through third grade students. The activity I’m going to highlight is called Parachute Surfing 2.0. You could also call the activity Parachute Carousel or Merry-Go-Round. The origin of this activity is why I love my Twitter #PhysEd Professional Learning Network. I was looking for something different than I’ve done in the past. That’s when I came across a Tweet from Stef Rothschild (@stefhayley80) called Parachute Surfing. 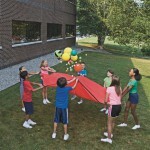 The short explanation is that everyone jogs around the parachute in a circle, while one student lays down and body surfs. The next day, I used the activity in class and posted a video of my students doing it on Twitter. The response was great (from most people). However, there were a few people that challenged my thinking. I love them for it! This is where the real activity was born. Nate Cline (@PEwithMrC) asked me if every student gets to surf. My initial answer was, no. My students could only support one surfer at a time. 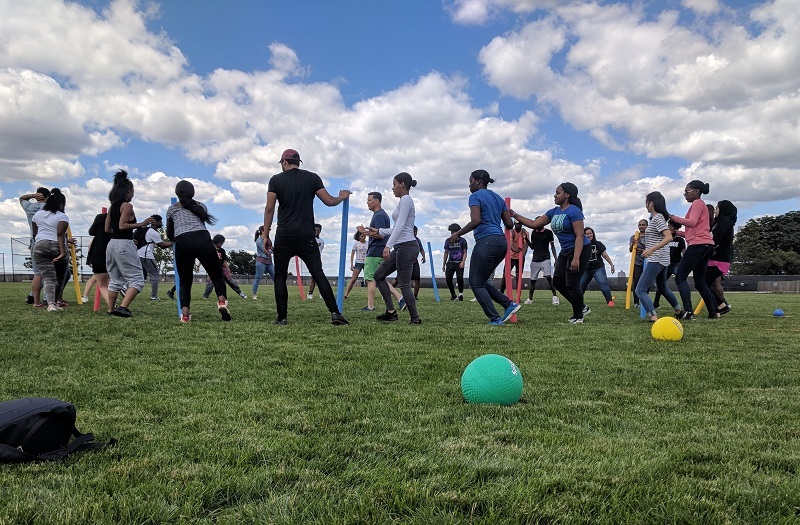 After five-minutes, only a handful of students would have a chance to do the fun part of the activity. I wasn’t proud of that. David Kober (@dkob5) then posed the question about how this would work on scooters instead. Then it hit me! Two or three years ago, I did this activity with the parachute and scooters for the first time. I had totally forgotten about it. One day, a student at my former school noticed that the scooters were sitting on the side of the gym while we had the parachute out. He or she invented Parachute Surfing 2.0 without even realizing it. However, I had a much smaller gym and safety quickly became a concern. I think we only did it one time with one class. David’s question brought this back to life! 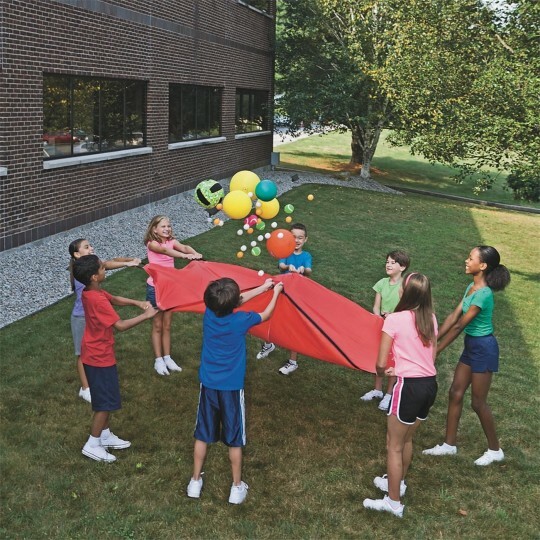 I set up the current version of this activity by having students grab on the handles of the parachute and walk, then eventually jog around the parachute. Once they are able to keep the parachute in the middle of the space, I introduce the surfers. Surfers are students that hold on the parachute with one hand, while laying their stomach on a scooter. Surfers are encouraged to hold on to the scooter with their second hand. They also need to make sure that their feet are not dragging behind them. Once students are in position, I have the group start by walking fast and eventually running in a circle. The obvious response is that this looks like a ton of fun, but also a safety risk. I encourage you to consider the following thoughts before doing this with your students. How big is your space? If your parachute fills your gym, I wouldn’t be comfortable doing this with my students. I would feel terrible if a student slid into a wall. However, if your gym space is large, you wouldn’t need to worry about that. This is probably the number one thing people need to consider. How well do your students follow directions? If your students struggle to follow directions on a regular basis, this may not be the activity for you. However, if you have a great relationship with your students and trust them to do the right thing, I would be comfortable allowing them to try this. I love my kindergarten students and feel they love me back. However, they don’t follow directions well enough to allow them to run during this activity. I don’t even have all my first grader classes speed up. The younger students still enjoy surfing if their classmates only walk fast. Trust your judgment. Other concerns: Students should not let go of the parachute when surfing. They will end up sliding around the gym. They should be taught how to stop if they accidently let go. It’s also important to remove other obstacles in the room, such as music carts or equipment. If possible, leave room in front of and behind the surfer. You may need have to adjust where the runners are positioned for this to happen. Many teachers have mentioned that they don’t have students hold the handles, because they may tear off. Something to think about, but I haven’t experienced this. The Rip-Stop parachutes from S&S are great for this concern. 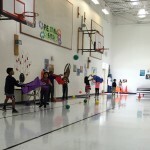 Tanner is the co-host of Let’s Talk #PhysEd with Jason and Tanner (https://www.youtube.com/results?search_query=%23LetsTalkPhysEd), a weekly YouTube talk show that interviews the most influential leaders Physical Education. Roos also serves as the editor and contributor for Cap’n Pete’s Power PE, PE Pirate Scroll (https://www.capnpetespowerpe.com/blog). He was also voted into the Iowa AHPERD Leadership Council. You can connect with him on Twitter @MrRoosPE or check out his classroom website (http://sites.linnmar.k12.ia.us/tannerroos/). 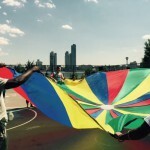 This entry was posted in Active Play, PE Activities & Games, PE Central and tagged active play, parachute activity, parachute surfing, parachutes, Physical Education by S&S Worldwide. Bookmark the permalink. Que excelente actividad , creo que hay cuidar mucho , las situaciones , del tipo de piso y grado de madurez de los alumnos , por lo demás , hay mucha creatividad , trabajo en equipo y diversión . Felicitaciones !! !